At the Shanghai Museum Shop and probably at many other Museum Shops this book should be available. 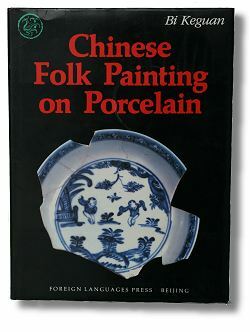 This is an unusual book even if in some minor parts some dates are wrong, but most important is that he has an interesting point in speaking up for the “peoples porcelain” min yao as an art form separated from the Imperial tradition. Translated from Chinese, the book discusses the art of underglazed porcelain painting at private kilns, various styles, decorations and artistic values. Its about the impressionistic and simplified peoples drawing that can’t help but being closely related to the Chinese written language. It is very easy to observe once you have begun to think about it and this is what makes this book valuable in my eyes. It also traces down the developmen of some well known patterns, and on the whole, makes common everyday wares more interesting. Beijing: Foreign Languages Press, 1991.